Learn about the link between logical arguments and electronic circuits. Investigate the logical connectives by making and testing your own circuits and fill in the blanks in truth tables to record your findings. A simple ecosystem consists of ample grass, a herd of 50 deer, a nest of 2000 rabbits, a cast of 10 hawks and a sleuth of 5 bears. Deer and rabbits are herbivores, hawks only eat rabbits and bears eat both deer and rabbits. Draw a food web, showing how the animals in this ecosystem are fed and what the transfer of energy is. The deer began reproducing rapidly. Some of the rabbits migrated out of the area. The bears were hunted by humans. In the autumn, a bear needs to consume as much as 40kg of food a day as it prepares for its winter hibernation. A hawk will eat up to 1kg of food at a time, although it can then go without food for a day or two. 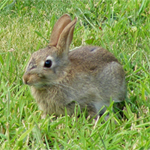 Rabbits reproduce quickly: a single female can produce up to 800 children, grandchildren and great-grand children over a season (February to October in the northern hemisphere, July to February in the southern hemisphere). Is this eco-system sustainable over time? STEM - living world. Biology. STEM - physical world. Visualising. Estimating and approximating. Real world. Maths Supporting SET. Mathematical reasoning & proof. Time. Mathematical modelling.